… it might be pretty confusing, right? Which one to choose in SoapCalc? And why there is so many of them! In this post I tried to gather everything (almost everything, since I forget things…) important I know about coconut oil differences. Typical coconut oil – much as any other plant or animal based oil or fat – contains mainly fatty acids in the form of triglycerides (now if you just fainted reading these words, I strongly recommend to look them up in wikipedia – it is really important! J). These guys are reacting with NaOH and turning into soap. So coconut oil contains around 93% saturated fatty acids, which means it is very resistant to oxidation and its shelf life is around 2 years (or more). phenolic compounds (caffeic acid, p-cumaric acid, ferulic acid, catechin) – which have antioxidant and antibacterial properties. However, not strong enough to work as a preservative. You probably know a difference between virgin and refined oil from the kitchen. The virgin oil is usually cold pressed, unrefined, keeps its fragrance as well as all the goodies. It is a bit more complicated for coconut oil. Virgin coconut oil is made from coconut milk only. However, majority of coconut oil is made from copra – dried coconut meal. Extraction is done either by cold pressing, fermentation or pressing using heat. This influences the fragrance as well as composition of non-saponifiables. If coconut oil is from copra, it is not virgin, even if it is unrefined and it has a different composition of non-saponifiables. Soooo, an oil that smells of coconut is unrefined, but doesn’t have to be virgin. Have a look into references  and  for more info on extraction. Fractionated coconut oil is made by fractionation – coconut oil is divided to different types of fatty acids. What we usually buy as fractionated coconut oil is a mix of triglycerides containing mainly caprylic (C8) and capric (C10) acid. INCI: Caprylic/Capric Triglyceride. You may have seen this in SoapCalc and you probably wondered – what the heck is this? One can do other fancy things with coconut oil apart fractionation. For instance, you can hydrogenate it – that means you can add hydrogen atoms to the double bonds of unsaturated oils, which means you convert them to saturated. This increases the oxidation stability and at the same time the melting temperature. Non-hydrogenated (original) coconut oil has melts at 76 °F (24°C). Hydrogenated coconut oil melts at 92°F (cca 33°C) – I read about higher temperatures, too, it seems to be connected to the level of hydrogenation. Most often, we can find mainly the original 76 deg oil. Coconut fat is coconut oil at its temperature below the melting point. In summer heat it quickly becomes liquid. Coconut oil contains mainly medium chain fatty acids, which make soaps that dissolve readily in water and therefore have the best cleansing properties. They make beautiful big bubbles, and in comparison with other soaps they clean also in sea water (and hard water). On the other hand, this is also why they do use up pretty quickly and are not resistant – if used for hand soaps, they get mushy. When using SoapCalc, unless you are sure you have 92 deg coconut oil, select 76deg. However, it does not really matter as to the saponification value since it remains the same for both – 174g NaOH for 1000g of oil with 5% superfat. That’s because hydrogenation does not change the number of molecules in the oil, just their type. I never tried the 92deg, but I read that it does not have an influence on the final soap properties – I would like to be corrected if you have other experience, please, leave me a comment below! Fractionated coconut oil can be used in soap just as any other oil, but it is quite expensive. I never tried it in soap, but given the fatty acids I would expect it creates soap with a lot of bubbles and good cleaning properties. I would use around 10% to increase bubbles. Attention! Since fractionated coconut oil is composed solely of medium chain fatty acids, it contains in 1 gram more molecules than normal coconut oil. This means we need more NaOH for its saponification. Its saponification value is 220g of NaOH for 1000g of oil (at 5% superfat). If you do not know if your oil is fractionated or not, most probably it is not. Fractionated coconut oil is too expensive to be sold as a simple coconut oil and it would be clearly stated on the label. In any case, testing is easy – if at 20°C it is liquid, most probably it is fractionated oil. 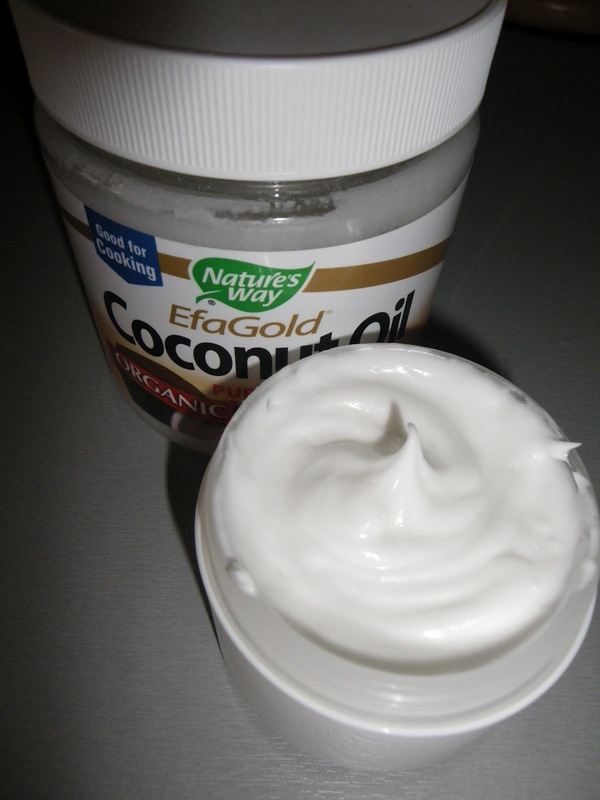 Fractionated coconut oil – what it is good for? First, it contains only saturated fatty acids. They say it has practically infinite shelf life, since there are no unsaturated fatty acids to oxidize. Since it is composed only of medium chain fatty acids, it is liquid. In addition it has no scent or colour. Also, it is well absorbed by skin. All together, it makes for an ideal carrier oil for aromatherapy and cosmetics. To make it a bit more complicated – fractionated coconut oil is not really considered an oil. You can find it listed in non-oil cosmetics preparations. Shorter fatty acids penetrate more readily skin and hair. Recently I read a study  where they tested protective effect of coconut oil on different hair types (straight, curly, wavy and permed) against damage by combing, UV exposure, bleaching and boiling. The oil was applied and left on hair for 14 hours to simulate overnight application (let’s hope shorter times are as good, since my night gets 14 hours long on very very rare occasions, and usually it is not the time I would consider having my hair „soak greasy“…). Check this amazing post of Susan on oils penetrating hairs (presenting some other scientific papers). 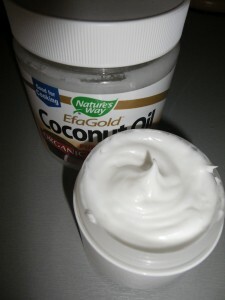 As for the skin, it seems coconut oil is not good for acne-prone skin, since it clog pores and makes acne worse. On the other hand is nice for normal and dry skin. I also read [now I can’t find where] that it increases the shelf life of other oils. … probably you know, but I have to mention it so that I don’t get lynched for forgetting it, coconut oil is very good oil for cooking. Yes, it contains tons of saturated fatty acids, but the „good ones“, since they are medium chain acids (MCA). This means it does not increase the levels of cholesterols and it seems they have preventive effect for colon cancer. Metabolic derivatives of MCAs (in other words what they become once we eat them) have antibacterial and antivirotic properties – thanks to their size they can penetrate protective membranes of bacterias and viruses and so destroy them. Scientists are now examining its effect in HIV treatment. But remember, you have to eat it first, therefore it is not good as preservative in your creams. The chemistry of coconut oil. This entry was posted by evik on April 27, 2014 at 23:44, and is filed under about ingredients, for beginners, oils. Follow any responses to this post through RSS 2.0.You can leave a response or trackback from your own site. 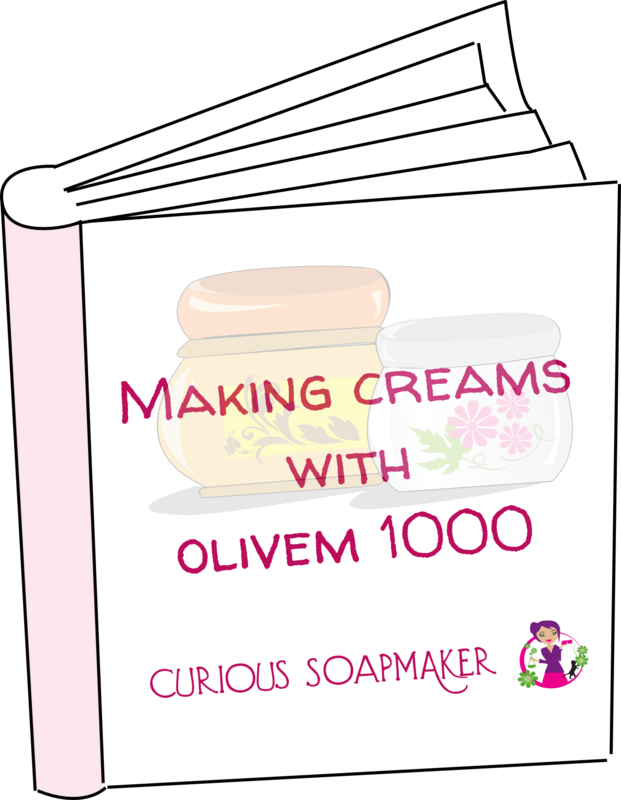 Hej there curious-soapmaker ! Love your blog and your experiments that clearly show that you think and analyse quite a lot before making any of the products ! 🙂 Keep it up. I was wondering that palmin (http://en.wikipedia.org/wiki/Copha or http://www.germandeli.com/Dr-Schlincks-Palmin-Coconut-Fat-250g.html) – the coconut oil that comes as a solid block – is highly hydrogenated and contains saturated fat. Is it correct to consider it as 92F oil ? 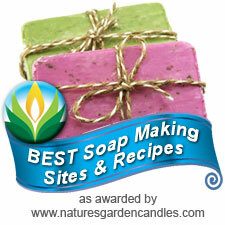 I have made three batches of cold processed soaps using Palmin so far, and all of them have turned out fine. I would love to hear what you think about it. Hi! I saw your comment and have the same type of block coconut oil, called Vegataline here in Africa. I would also like to make soap with it and that was my question. Could you use this hydrogenated block coconut oil to make soap? Did you use the recipe from this article? Also, we can get orange peels free here and I was thinking of adding some of those to my soap. Do you think that would work? This is my first time attempting soap! Any hints would be greatly appreciated! Thorough information, thank you very much. Hi, I just read this post, as I am looking to import coconut oil. Many buyers list virgin coconut oil which is clear and liquid. From what you said, I gather that this will not affect saponification values…is this correct? 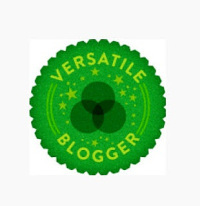 I’m definitely going to bookmark your site! Hi Jan, virgin coconut oil is just coconut oil. It is liquid over 25°C, below it starts to get solid. Normally in the summer (here in Europe), it is liquid, the rest of the year it is solid. It should have SAP value of the coconut oil, no change. Hi Valerie, I believe you can, yes! Need your suggestion to understand that can we manufacture any other coconut product that is required for industry(any). im new to soap making. i need help. my question is CAN I USE coconut oil fro COPRA extracted heat pressed for soaping?? what qualities will the soap have. i have oil the oil that is slightly beige in color and smells great..
Hi Akii, yes, indeed you can use the heat pressed coconut oil from copra, that is is I believe usually how coconut oil is prepared. Anyway, while it smells great, it definitely wouldn’t keep the smell in the final soap, the fragrance just doesn’t survive alkaline conditions :-(. If you use 100% coconut oil in your recipe, the soap will have very guick lather, will be very hard and might be a bit drying.